You may recall deployment being one of the four cornerstones. You achieve three objectives in this phase: Get buy-in from users Make the Anaplan process stick in the organization Secure return on investment (ROI) Deployment plans are developed with the customer well in advance of the actual time that the Anaplan platform is ready for general availability. Tasks Deliverables Tools Communication plan Work with the project sponsor to execute communication plan See template included in Communication section in this chapter. Communication about the project should begin during the Implementation phase. Training of users Work with project sponsor to develop training plan See tools and examples included in Training section in this chapter Documentation Overall model schema; Regional and business unit model schemas; Data and metadata schemas; processes documentation; Model maintenance; Model data flow; Base model blueprints; FAQ’s Coming soon! Gather user feedback N/A Customer Health Model Monitor Deployment and Performance N/A Splunk Conversation with customer regarding future Anaplan plans N/A See Plan Ahead and Future Project section. Training facilitates a return on the customer’s software investment. If users don’t know how to use the Anaplan platform, will they be able to complete the new process? You have already planned for a good user experience by creating easy-to-use dashboards. 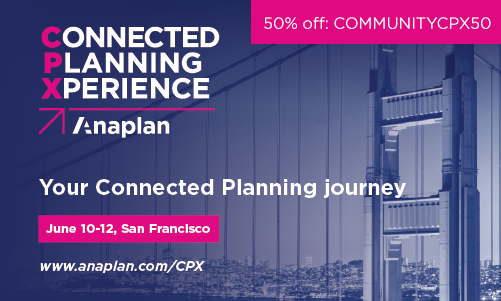 Keep in mind that users are experiencing a behavior change -- so even the most user friendly model requires some training to help users make the change to Anaplan Some organizations may have training departments that develop all new software training. If this is the case, plan to include some members of the training staff in sprint reviews and UAT (they generally are excellent testers!). If the organization doesn’t have anyone to assist with training, work with the customer to determine which audiences need training, what they need to know, how training will be delivered (classroom, virtual, etc.) and when the training will be delivered. Keep training simple: develop a job aid, which is a step-by-step guide for how to perform a task. The job aid forms the basis of the training program, with a trainer demonstrating the process. If a live demo is not possible, screen shots can be used. Participants follow along and ask clarifying questions. Training for Model Builders All Anaplan users who will be designing, building and maintaining Anaplan models require official Anaplanner accreditation. Only certified model builders who have successfully completed the Anaplan Certification course should be allowed to build on the Anaplan platform. Introduction to Model Building training is a 2-day instructor-led course. The course may also be completed using the On Demand version of the course - available in Anaplan’s Learning Center. Introduction to Model Building covers and assesses key elements that will allow users to build on the Anaplan platform. In addition, Anaplan offers intermediate-level model building courses and advanced topics. After go live, monitor performance to ensure a strong customer experience, expectations and service levels are met, and that the model is being used, promoting adoption. Call quick attention to issues so that you can work with the customer to address them as quickly as possible. Typically, monitor models with one or more of these characteristics: High volume High complexity High concurrency Before you share performance information, make sure that you have already established SLAs for model performance. In addition, be selective about who receives information regarding performance, as some statistics will need translation. Create an Anaplan performance app to monitor performance. Anaplan uses Splunk reports to populate the app with data. Determine the frequency of monitoring, the audience and also create clear translations of the data for the project team. The app will include Minimum, Maximum, Average and Median values for: Model load time Model save time Toaster time Response time by object, measured in milliseconds Dashboards Modules Large calculations List loads Actions Processes User The Anaplan Way also focuses on maintaining customer’s satisfaction with the investment they made in time, people, and cost. Customers should feel comfortable saying they built a solution for their future business success. No enterprise system runs flawlessly on its own 100 percent of the time. As with any system, Anaplan and the customer must monitor what’s happening as more data and calculations are added to models, more users are added to the platform; new and emerging processes cannot be overlooked. Make monitoring a high priority for Anaplan as a critical process for every project team’s success. Put reliable systems in place to track performance and fix defects at the earliest possible stage. These practices help you succeed with your customer and help customers expand their use of Anaplan to drive their business performance. We want to ensure that our project teams are using their models, they have trained model builders on staff, and they are happy with the way the model is working in their business. Client Directors and Business Partners perform check-ins at the 30, 60 and 90-day marks after go-live. Update the Customer Health model with the information gathered. If the customer does not have a change management process in place for business processes, work with the customer to establish one. This can be as simple as gathering user feedback and tweaking the process accordingly, or it can be complex, including prioritization, scheduling, and delivery of updates to the process. Consider the solution you have delivered as a first step, which requires modifications after delivery. Regular modifications ensure that the model supports changes in the business process. Modifications to the business process can be more quickly added during subsequent releases with Anaplan. After successfully launching the first release, revisit those items identified in the Process Workshop as other parts of the process the customer wants Anaplan to do. Do you remember when you did the white board of the business process and determined what this project would include? Revisit that whiteboard with the customer to determine what the next step is. Determine what the upstream or downstream models might be. What was the project team’s first use case? What are the models that send data to the model? Here is an example to help you think about this: You may have started, for example, with a territory and quota model. What’s upstream from a territory and quota model? It’s usually some strategic targets or it could be some sort of market segmentation data or some sort of share of wallet analysis that you’ve done. There could be varying model and data sources that could be produced on Anaplan. Today they could be in Excel or they could be in a legacy system. They could be used to actually feed the territory and quota model that you’ve just produced. Similarly, there are models that are on the same level as territory and quota. And there are other models that territory and quota could feed. For example, territory and quota could feed an incentive and compensation management system. It could feed a territory allocation-type model. Those models could feed a P&L—cash flow and balance sheet for financial statements. The territory and quota could actually feed a sales forecasting model; this may be itself fed from Salesforce.com but has the strategic targets and then some forecasting within itself. That sales forecasting model then feeds a P&L. You can see there’s sort of a web of models upstream and downstream and models that are actually in line with one another that feed different models but can be used by Anaplan. What’s critically important, of course, is that all of these things are fed from a central metadata hub that you can set up with Anaplan so that all of your metadata and all your data can come into that central location and then feed the different use cases, which themselves are connected to one another. The customer may also look to create their own competency center, or Center of Excellence (CoE). With a CoE, customers build an Anaplan practice and models that will connect across the business. See Chapter 8, Center of Excellence for more information.